For whatever reason some of the best trades have a tendency to occur after they almost get stopped out. I can think of a number of trades that i've had in the last few months that came within a whisker of stopping me out before reversing and turning into nice gains. The most recent example of this comes in the form of Valero Energy (NYSE:VLO). 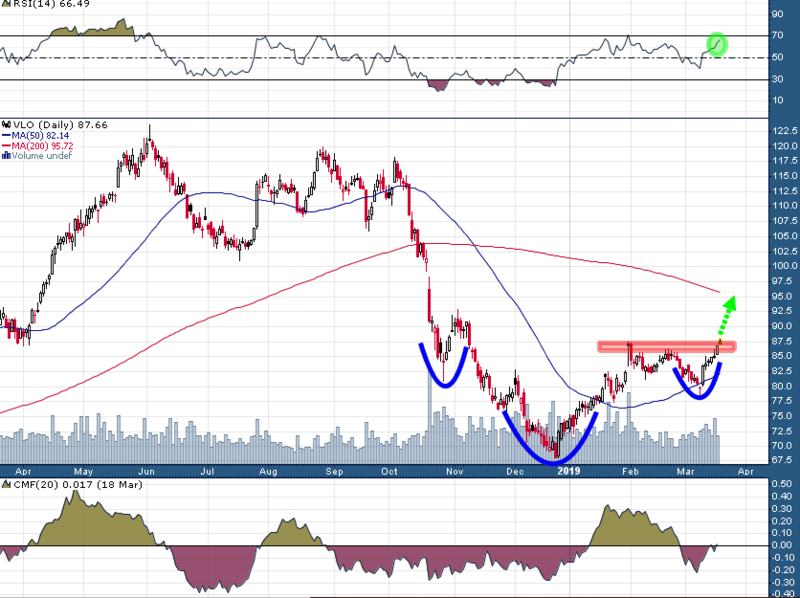 I liked the recent momentum and saw potential for Valero shares to move into the volume-by-price 'gap' between ~$92 and ~$100. 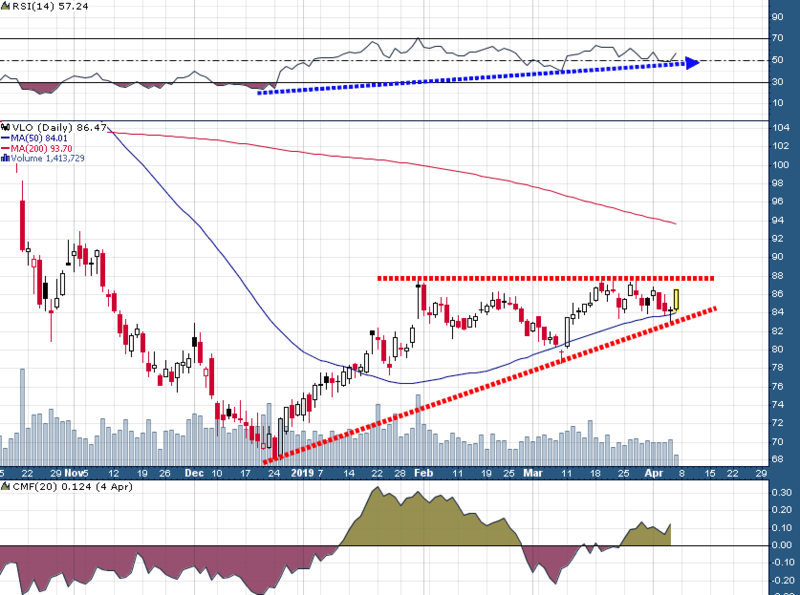 However, as it turned out the market wasn't ready for Valero to move much higher. In fact, my entry virtually top-ticked VLO's move (it made a high of $87.95 that day shortly after I entered). This stuff happens, it's the reality of trading. We're going to top tick moves sometimes, we also might sell out at important lows just before a stock reverses. 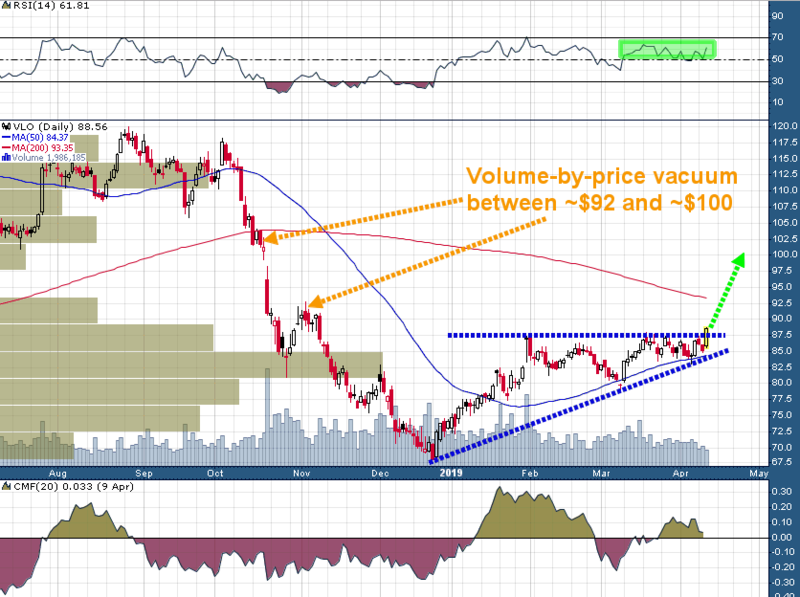 Over the next few weeks VLO proceeded to gyrate in a range between roughly $83 on the downside and $87 on the upside. Thankfully i've come to use a simple, yet effective formula for most of the stop losses on my trades (2 x 14-period Average True Range for the time frame i'm trading) - this meant that I gave VLO just enough room to not get stopped out when it dipped as low as $83.04 on April 4th. While my entry on March 19th may look questionable in hindsight, the fact is that sometimes the best trades take time to materialize and reach fruition. This definitely seems to be the case with Valero as it proceeded to form an ascending triangle with a relatively tight consolidation just above its rising 50-day moving average. As the Valero swing trade evolved I became more confident in the validity of this setup, which prompted me to add to my position a couple of times. I don't recommend traders do this regularly (average into a trade at lower levels), however, when the risk is clearly defined and all signs are pointing to an imminent breakout I think the pro move is to size up ones position. I have raised the stop on my entire position to $84.99 which is still roughly 2x Daily Average True Range from the high of today's session so far ($88.80). There should be some minor resistance around the round number $90 level and then near $92. However, above $92 I could see VLO shares moving up quickly as there is very little 'price memory' between $92 and $100. This should equate to much less overhead supply than one might normally anticipate over such a wide price range in a large cap stock. The proper implementation of stop losses and position sizing are probably the two most important topics for traders and I don't see them discussed very often. Most are focused on stock picking and trade entries, however, in reality one can have a relatively poor entry (as I did on this trade) and with proper stop placement and position sizing still manage to carve out what could potentially be a very nice profit. Stop loss level distance from entry price should be at least 2x the 14-period ATR (average true range) for the time frame you are trading. Be clear on your time frame! Position should be small enough so that if you are stopped out at your stop level that you won't lose more than 2% of your trading capital (and usually not more than 1%....2% is only for higher conviction trades). I believe that with effective implementation of the above rules any trader of any experience level will be able to give themselves a real chance to be successful. Better trade entries and setups are simply the icing on the cake! Disclosure: Author is long VLO (Valero Energy) shares at time of publishing and may buy or sell at any time without notice.